You would never or hardly see yours truly in any party scene simply because I myself know I'm not a good drinker and seriously, I would just had a sip of the alcohol drink if I really had to, simply because I do not like the bitter taste of it. I guess some of the colleagues of mine were quite surprised when I ordered warm water instead of enjoy the beers during our happy hour last time! Now you know how silly I am. Being selected as one of those to join the happening Hennessy Artistry event to Penang was quite a great experience to yours truly. The experience of party with the celebrities? It's my first time. Prior before the trip, I wasn't really expect much but I know it definitely be fun. Woke up extra early just to catch our plane to Penang definitely not what I wish for especially when it is on the weekend. The road jam condition doesn't help when we're heading to Straits Quay. We know we’re quite behind our actual schedule and even though it was quite a limited time given to us for the lunch time at Blue Reef Fish & Chips, it was still a pleasant lunch for all of us. Each of us gets to order our favorites dish and as if like we knew each other for quite long that we’re sharing the dish. Each fish dish that we had ordered was so delicious and huge portion that satisfied our hungry tummy since the morning. After the pleasant lunch, we then headed to the venue where Hennessy Artistry will be held at for the Meet & Greet session with the artist of the night. Upon entering, I was totally surprised with how the booth designed and how everything filled up the spacious space. A simple yet luxury lounge-like were totally delightful. Not only that, we get to enjoy the cocktail drink and my favorite would be the Hennessy Apple. During the Meet & Greet session, we were introduced with the pretty and handsome looking artists that will be party with us on the night. Also, get to know more about them during the Q&A section. It was such exciting moments get to meet them up close in front and had the chance to take photo with them too! Well, as mentioned in my previous post, they were Suki, Ernest C, Lollipop F, Andy Moor and Ramsey Westwood. Once the Meet & Greet session finished, all of us get into the coach bus and it was finally the moment that we’re waiting for – check into the hotel. The accommodation that provided for us to have a night stay at Penang was G Hotel. Our stay includes complimentary minibar as well as buffet breakfast. Yours truly totally love how spacious the room and enjoyed the splendid view from the room. Obviously, we did not have much time for us to even take a nap but rushed to prepare ourselves for the night already. 6.30pm, we get onto the coach bus and headed to SQCC for our dinner. We had our dinner at Hisago Modern Japanese Restaurant. I am a sucker for Japanese food, God knows it was a joy for me! I had a set of sashimi all for myself and loved how fresh it was and not to forget about the delicious side dishes too! Oh-so-yummy! 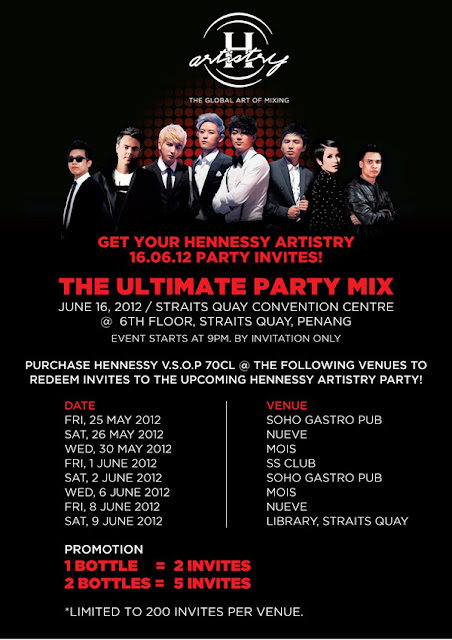 Next schedule followed up after the dinner would be none other than the Hennessy Artistry party night! Wohoo! I’m excited though am not really know how to party like one, I even imagined how I would be just sitting down at there and enjoyed watching the people surrounding me. So yea, surprisingly not bad! All of us took turn to have a photo snapping session like entering the red carpet, showing off by holding the Hennessy VSOP bottle and kaching! Just like a celebrity! The moment we entered the hall, yours truly get amazed how it turned out to be! No, it’s definitely not just about party but some other entertainment too! Some of us grabbed the drinks, some of us playing the games, and some of us went up to the stage for the 360 cam booth. All you need to do just get up and pose or grab the props and tadaa! You’re snapped and recorded. Here how you can see the awesomeness of it! I must say it’s definitely not an easy task to be one of the artists for the night, you get to know how to keep audience entertained as well as being interactive with audience for the night! I enjoyed myself max on that night, being very glad that I get to meet friends from Penang, met more new people and make friends, totally cool! Later midnight, there’s nothing we wished for except for comfy bed for a good night sleep. Woke up in the morning and enjoyed a buffet spread breakfast, such a blissful life! Everyone seems so energized after the breakfast and after packed our luggage, it’s time for us to head to the airport while waiting for the flight back to KL. All this kind of experience, much thanks to Person Edge, G2 and Hennessy Artistry, not only for the awesome party night but also the great hospitality. P/S: Some photos credited to Henry! How To Treat Dry & Dehydrated Skin? July Beauty Box from Fabulous Finds!